It’s not easy to create a powerful structure on such an emotionally charged location as the site of the September 11, 2001 attacks on the World Trade Center towers, but architect Santiago Calatrava brilliantly stepped up to the challenge. That said, it was not without intense challenges and controversy. The Oculus was completed seven years behind schedule and went aggressively over the original budget, costing close to $4 billion dollars. Many of problems were apparently due to owner hold-ups and changes. Now that it has been completed 14 years later the design has critical acclaim, however the overall functionality as a transportation hub (passenger flow and comfort) remains an ongoing challenge. New York and the tragedy inspired Calatrava to create something extraordinary. His vision was a winged dove, an organic form that holds its own and almost floats among the complexity of many straight lined towers as well as the two square shaped memorial fountains surrounding it. Its overall message is one of hope. 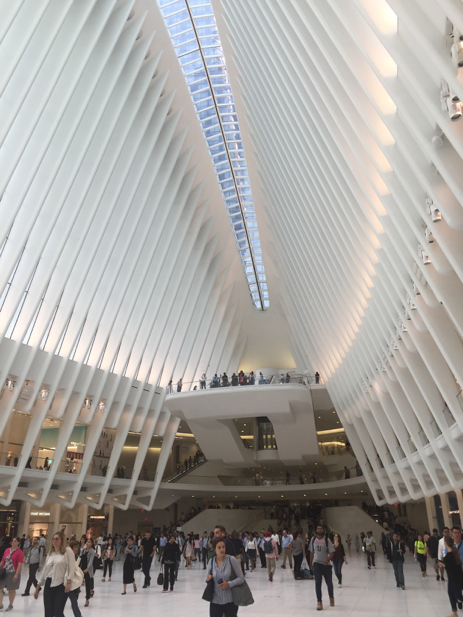 The Oculus building functions as a portal to a transportation center as well as a premier mall (Westfield World Trade Center) and dining destination. It holds a variety of wonderful shops including an Apple Store and connects to the massive Eataly-- a mecca of everything Italian. It also has an underground passage to Brookfield Place, another large high end mall in the area. The station connects the PATH (which connects New York and New Jersey) with the New York City Subway system as well as further connecting Fulton Center and the Battery Park City Ferry Terminal. The design of the building curves out like wings of a bird and holds a long skylight that runs the length of the building. The skylight is opened on or around September 11th every year. Also as a memorial to September 11th, a powerful and stunning memorial, the Tribute in Light is presented once a year, as a reflection of the twin towers that once existed. It is now an iconic symbol that celebrates the unrelenting spirit of New York. When you are fortunate to be visiting Paris, I very highly recommend a visit to the art museum Foundation Louis Vuitton. It's a quick jaunt from central Paris and will be worth every second once you arrive. While Paris has many outstanding places to view art, there is something extra inspiring here. My feeling is much of it has to do with Frank Gehry's overall design of the building. There are enticing and visually captivating angles everywhere, many integrated water features and even the views of the surrounding park are highlighted. Talented French artist Daniel Buren has recently unveiled a new installation by covering the exterior shell of twelve glass sails of the Foundation Louis Vuitton building with a stunning array of multicolored effects that elegantly filter the light. The arrangement includes bright primary colored squares in red, blue, yellow and green - brilliantly animating the architecture with colored hues for all to enjoy. The Foundation Louis Vuitton was designed by the famous Canadian American architect Frank Gehry to resemble a cloud of glass. He was inspired by the shapes of sails on a sailboat in the photograph below on the left. The art museum is composed of eleven exhibition galleries of contemporary art as part of the permanent collection, as well as further temporary exhibitions and commissions. Additionally there is an auditorium for performance space, restaurant and meeting, event and educational spaces. One of my favorite spots is the overlook on the stairs viewing the central restaurant, where you enjoy an excellent view of Frank Gehry's fish light installation. Antoni Gaudi (1853 - 1926) was a Spanish Catalan architect from Reus and is known best by his highly individualized style of design, Catalan Modernism. Most of his works are located in Barcelona, Spain including his most famous, yet unfinished La Sagrada Familia. In 1878 when Gaudi graduated from Barcelona's School of Architecture, it's director proclaimed: "Gentlemen, we are here today in the presence of either a genius or a madman". Unfortunately during his lifetime there was little enthusiasm or respect for his work. Apparently Pablo Picasso thought of his work as "crap" and George Orwell (both living in Barcelona for a time) described Gaudi's La Sagrada Familia as "hideous". Gaudi was influenced by his own passions including architecture, nature and religion. He became part of the Mondernista movement which reached its peak in the late 19th and 20th centuries. Gaudi went further by creating a design style that was organic through natural forms. He was incredibly detailed and integrated arts and crafts such as stone sculpting, wrought iron work, stained glass and intricate and colorful ceramic tile work. Gaudi went against mainstream by rarely drawing detailed architectural plans but instead creating 3D scale models and refining details as he went along. He now has achieved global recognition and admiration and continues to be a topic of study in architectural schools. Seven of his works have been declared World Heritage Sites by UNESCO. I personally adore Casa Batilo which was a restoration of an old traditional house built in 1904. You can and absolutely should purchase tickets to tour this architectural wonder. It's fanciful design uses stone, wood, stained glass, ceramics and forged iron. The organic shaped curves and beautiful stained glass windows are exceptional. It is mind expanding to visit his most famous work, the incomplete La Sagrada Familia, which is now the most visited site in all of Spain. The large Roman Catholic church has been under construction since 1892 with a targeted completion in 2030. The distinctive architecture and highly detailed facade sculptures explore a relationship between man, nature and religion. It combines the Gothic style with Art Nouveau. The original design by Gaudi calls for eighteen different spires to represent the the Twelve Apostles, the Virgin Mary, the four Evangelists and Jesus Christ. Inside, there is further inspiration from nature with the columns drawing inspiration from trees and branches. The building construction is not funded through any government or church related entity. It is fully funded privately and through visitor fees which support the annual construction budget of close to 25 million euros ($28.38 million). If you visit, you can currently access open areas including the nave, crypt, museum, shop, and both the passion and nativity towers. © 2018 INDULGED LIVING / KIMBERLY SUTTON DESIGN LLC,. ALL RIGHTS RESERVED.